WHAT ARE PLANNING AND ENVIRONMENT LINKAGES? Planing and Environmental Linkages (PEL) represent a collaborative and integrated approach to transportation decision making that considers environmental, community, and economic goals early in the planning stage and carries them through project development, design, and construction. This can lead to a seamless decision-making process that can help reduce and minimize impacts, minimize duplication of effort, promote environmental stewardship, and reduce delays in project implementation. 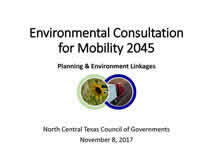 With increased emphasis on transportation's role/impact on the environmental, community, and economic well-being of the region, the continuous introduction and consideration of environmental topics such as climate change emphasizes the important linkages between the long-range transportation planning process and environmental planning. 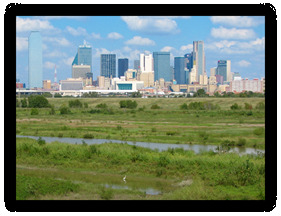 The Dallas-Fort Worth Metropolitan Planning Organization (MPO) is working to implement PEL efforts in consultation with resource agencies. In October 2008, NCTCOG entered into an agreement with the US Army Corps of Engineers (USACE) to find a position to expedite permitting for regionally-significant transportation projects. This agreement allowed the USACE to assign a dedicated staff person to expedite permits. The USACE legislative authority to enter into these agreements is supported by the Water Resources Development Act of 2000 (WRDA) and was extended through 2016, allowing NCTCOG to continue to enter into agreements wit the USACE. NCTCOG and regional transportation partners have benefited greatly from this agreement. Enhanced communication has led to faster permitting times, reduced impact on the aquatic environment, and reduced cost for mitigation efforts.